No. I’m not lost. The trail is right there behind me. Okay, so how come there is no trail in front of you? I’m not lost. I just have to get to the meadow above Scout Falls. That wide spot in the bush looks like it leads to the top. That’s a wide spot because bushes can’t grow on rock walls. I can make it up that wall. If you fall and injure yourself, no one will EVER find you here. Last weekend I did two things I had never done before. The first was I attempted to climb Mt Timpanogos. It’s the most dominate mountain in the Utah county portion of the Wasatch range. It’s 11, 752 feet tall. Our 14 and 15 year old scouts do this hike every year. I didn’t have time to go. I’ve got a ton of stuff that I should have done. My 15 year old son decided he wanted to go. My schedule suddenly cleared up. It actually didn’t, but I went through one of those, “Twenty years from now, what do I want to remember about this weekend?” exercises. Do I want to remember that I spent it studying and working, or do I want to remember that I climbed 2 miles into the sky with my son. When you are not the leader, but instead are just going as a dad, you are just responsible for yourself. In fact, since I wasn’t sure I was going until the last minute, I even took my own food. This was a backpacking trip. We were planning to hike in about 2 miles on Friday, camp Friday night and get up early Saturday morning to try for the summit at sunrise. The trip started well enough. I have a very comfortable backback and while my water was a little heavy, overall, my pack was pretty comfortable. It was about 40 lbs. Sixteen pounds of that was water. This is Utah, and it’s a desert, and it’s August. The other leaders were taking water purifiers. But, I wasn’t taking chances. I packed 8 liters of water, about 2 gallons. 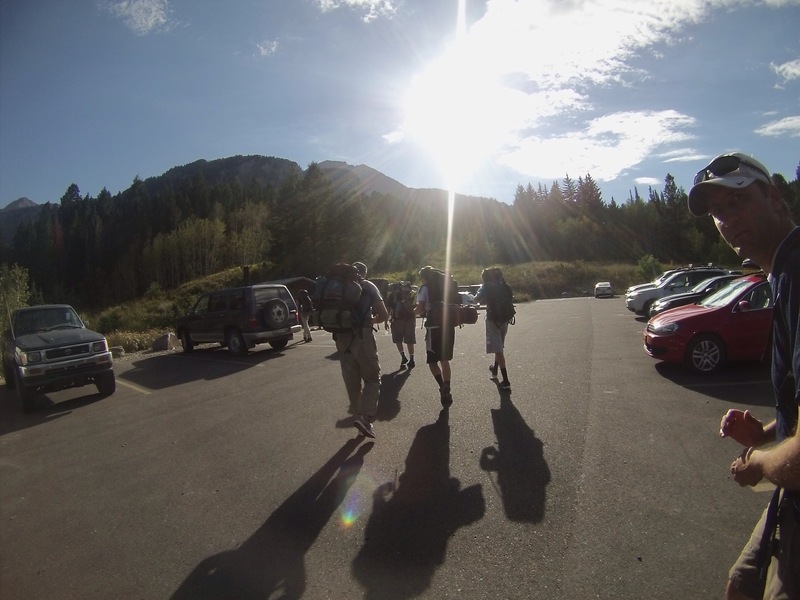 As we started from the parking lot, the boys ran on ahead. The adults took a more leisurely pace. I enjoyed my lack of responsibility. I had even forgone my normal practice of taking a map. I wouldn’t need it. I was hiking with a group and they were experienced with the area. We hiked for the first mile and a half in the wrong direction. Is that a road down there? Yeah, I don’t remember hiking next to a road last year. Hang on. Was there a sign on that bridge back there? We retraced our steps all the way to the parking lot before we found the right trail. 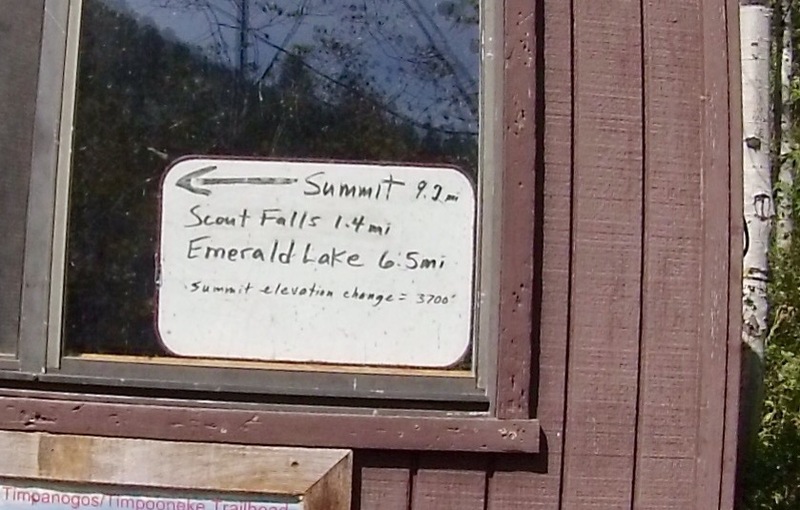 Funny thing, the right trail had a sign pointing us toward the summit. Again, the young men set the pace. This time led by the leader who’d done the hike previously. I, as always was part of the last group. I’m a slow hiker. I know it. I don’t even try to keep up with the youth. I could tell I was also holding back the other two adults I was with. Finally, they left me with a “just follow the trail, we’re camping in the meadow above Scout Falls,” and picked up their pace. Okay, simple enough. I’ve hiked many canyons in Utah. There are very few turns. (Canyons make that difficult.) I trudged on, my creaky knees already warning me about the pain to come. I didn’t expect the fork in the trail. I also didn’t see a rock cairn. A cairn is a pile of rocks that serves as a road maker for those following behind you. I kind of wished I’d brought a map. I looked at the two paths and both looked equally likely. A verse from Robert Frost sprang to mind. I turned left. I later learned my group had turned right. Earlier I mentioned I did two things I’d never done before. The first was to attempt to climb Timp. The second? I got lost. Right there with Robert Frost whispering in my ear, I became lost. I didn’t know I was lost for a long time. If I had know, I might have turned back sooner. Okay, I never actually turned back. But, I might have if I’d know. As I walked I could hear water. Ah ha! Scout Falls. I was headed in the right direction. My wrong path didn’t immediately look bad. The first indication that I might be on the wrong path was the rock slide. It was very stable, very rocky and very tall. About 300 feet at a fairly steep angle. Would you assume it was the wrong way? We were climbing a mountain! This seemed perfectly normal. The scramble up the rock slide was also the first time I seriously thought about what a pecarious position I was in. 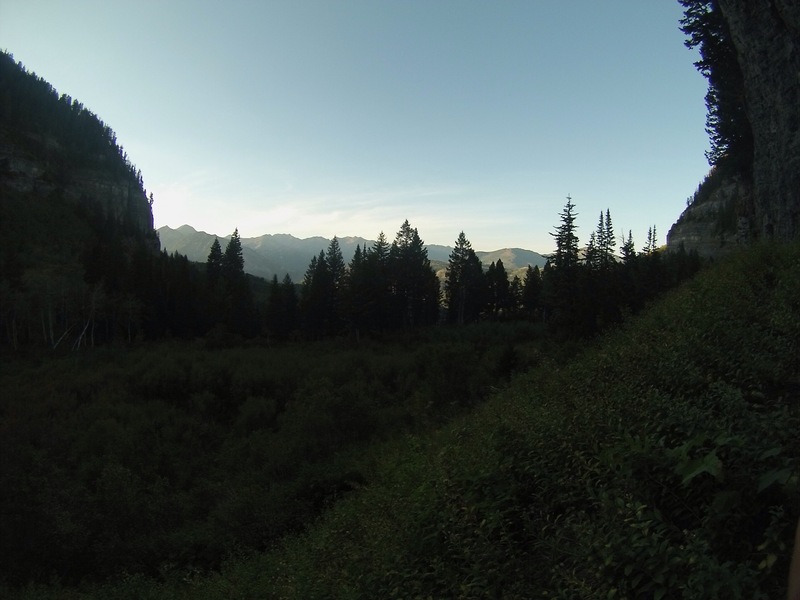 I was off the main trail, I was alone, and serveral times I nearly lost my balance and toppled over backward. Remember that 40 lbs backpack? Yeah, it kept throwing off my balance. After a sweat-soaked scramble up the rocks, I was rewarded by the falls themselves. And best of all, there was a clearly defined trail. Unfortunately, it went left and right. The falls were not the end point. Now what? Left or right? Robert Frost was really not helping. I gazed left as far as possible and then looked right. The trail to the left seems slightly more worn. (Had I gone right, I would have hit the main trail in 100 ft.) So, off I went to the left. And it was at this point I started having conversations with my conscience. The trail curve toward the rock wall. The angle got steeper. I secured my walking stick to my pack so I could have both hands free to climb. The trail got narrower and narrower, and then I hit the wall. Literally, there was a wall. It appeared to be the last obstacle keeping me from the top of the falls. Remember, the boys and we were camping in the meadow above the falls. 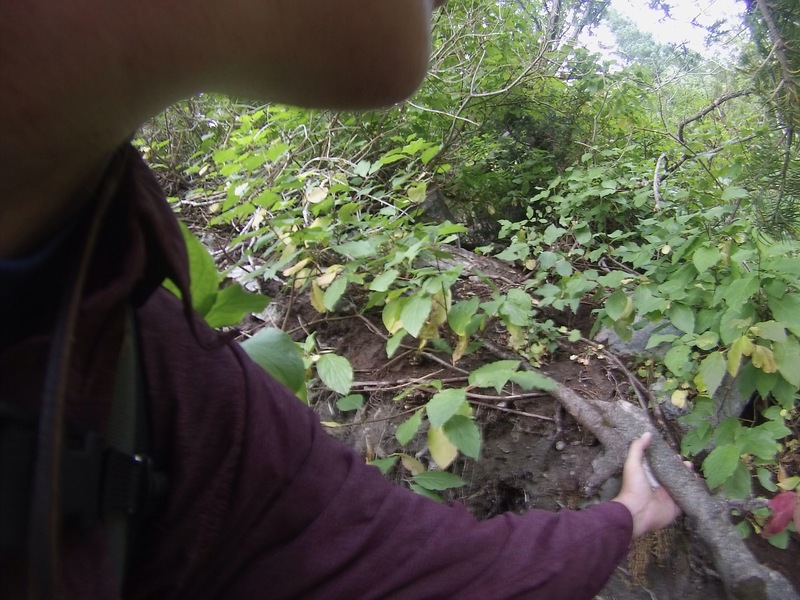 I only had another 15 feet, and once I got clear from the underbrush, I’d be there, although by an unconventional route. A tree grew along the top of the wall, It’s trunk twisted over time by the harsh Alpine winters. Taking my maple walking stick I wedged it between two sections of the trunk. keeping a firm grip on it, I clawed for toeholds, my heavy leather boots slipping on the granite wall. A toehold here, a knee brace there, my free hand clutching at tree limbs, all the while my backpack and its protruding tent and sleeping pad pulling me backwards, I finally scrambled over the top. I literally fell against the branches blocking my path to force them to give way. But, I made it. I was above the falls. Now to get out of this thicket and find the meadow. I made it out of the thicket. I found the meadow. But, there were no boys. There were no camping spots. There was no trail. There was a 70 ft granite wall that stretched from one side of the canyon to the other, a distance of about a mile or more. For the first time, I seriously considered that I might not be getting out of here tonight. The sun was headed for the horizon. Night comes quickly to the canyons. I figured I had about two hours of daylight left. I wasn’t scared. I was annoyed. I admit I was lost. And I kicked myself for not bringing my own map. But, I had a fully stocked backpack. I had food for two days. I had eight liters of water, plenty for two days. I had a lighter and a good knife. There was plenty of dry wood if I needed a fire. I was carrying the tent that my son and I were planning to use. But, I was still lost. I finally decided that I was willing to ask for help. My voice echoed off the wall on the far side of the canyon. But, other than my own voice, and my annoying conscience, there was no answering call. 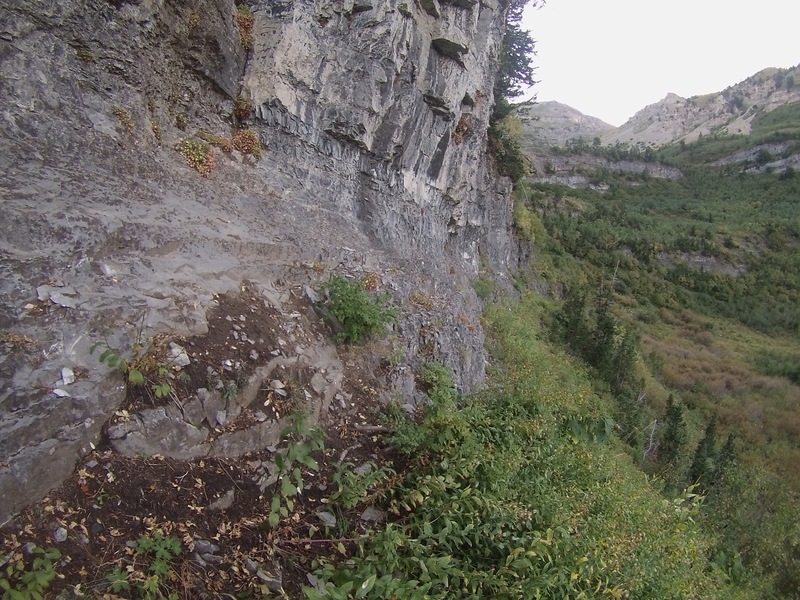 I made my way across the meadow to the base of the granite cliff. There was no chance I was scaling this cliff. It now became obvious that the trail was to the right, not the left.I found a thin game trail along the base of the cliff. I turned right and continued on. Was I lost? Mostly. I knew that if I walked far enough to the right, which was North, I would either cross the trail or I would reach the granite wall that I could see a mile ahead running perpendicular to the wall I was hugging. There was really no other choice but to try to make my way through the mass of broken branches, devil’s club, thistles and five foot high grasses that are the parodoxical high-mountain-desert-swamp. The cliff was still to my left and I could see I was less than a quarter mile from the connecting cliff. If I didn’t stumble across the trail soon, it would mean that I was REALLY lost and the trail was actually on the other side of the cliff facing me. The voice of my son caught me off guard. Glancing up at the cliff to my left, I saw him standing and waving his arms. DAD, ARE YOU ON THE TRAIL? I found out that the other leader had left a note scratched in the dirt at the fork in the trail. Either someone walked over it, or I simply didn’t see it. Amazingly, I was only about 15 minutes behind the rest of the group arriving at the second meadow above the falls.. They didn’t even realize I had been missing. An inauspicious beginning. My knees hurt. My back hurt. And we hadn’t even started the challenging part of the hike. Tomorrow: Waking up at 3:00 AM for a climb in the dark.